Welcome, ladies and gentlemen, welcome to the longest birthday party on record – at least for a five year old. The Joyce Theater turns five this year, and the dancing will go on long past many dawns: thirty-two weeks of performances are planned to show off at least forty new dances. Guinness Book of World Records, wanna dance? The Joyce has been growing up – fast. last year the theater sold $1,463,612 worth of tickets and played to 86% capacity or 107,240 admissions. The Joyce’s first season, 20 weeks in 1982/83, grossed $592,866 in revenues and was attended by 54,866 people. This season, twenty-nine ballet, modern, and ethnic dance companies will offer a total of 235 performances, making the Joyce Theater the busiest dance stage in the world. The Joyce Theater Foundation itself will produce the Nikolais Dance Theatre for three weeks, December 16 – January 4, marking the company’s first New York season in three years, followed by a return of the two week Joyce Sampler, which this year includes the companies of Remy Charlip, Ze’eva Cohen, Pooh Kaye, David Parsons, Eleo Pomare, Kathryn Posin, Marta Renzi, and Mitchell Rose. There will also be a month of Pilobolus, January 27 – February 22, and the revival of Meredith Monk and Ping Chong’s classic “The Travelogue Series: Paris/Venice/Milan/Chacon,” March 31 – April 5. The dancing starts officially September 23-28 with a week of performances by the Erick Hawkins Dance Company, followed by the return of Los Angeles’ Jazz Tap Ensemble with guest artist Gregory Hines, September 30 – October 5. The Feld Ballet then takes over for three weeks of performances that include three premieres and the revival of Feld’s “Harbinger.” There will also be a week of performances by HARRY (October 28 – November 2) ; Dan Wagoner and Dancers (November 11-16) ; Peridance (November 18-23) ; Ballet Hispanico of New York (December 2-7) ; North Carolina Dance Theater (December 9-14). The Armitage Dance Company takes over January 20-25. Then there will be Rosalind Newman and Dancers (February 24 – March 1) ; the Feld Ballet (March 3-15) ; Murray Louis Dance Company (March 17-29) ; Laura Dean Dancers and Musicians (April 7-12) ; Nanette Bearden Dance Company (April 14-19) ; Jennifer Muller and The Works (April 21-26) ; Molissa Fenley and Dancers (April 28 – May 3) ; Contemporary Japanese Performance (May 5-10). The Joyce dance season will conclude with a week of performances by the Lucinda Childs Dance Company (May 12-17). 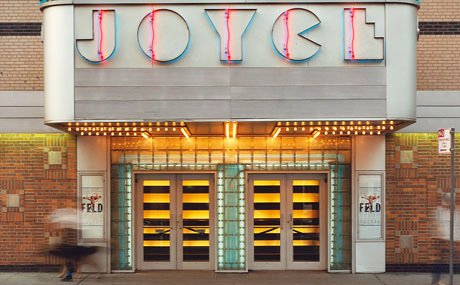 The Joyce Theater is located at 175 Eighth Avenue at 19th Street in New York City. For ticket information call the Joyce Theater box office at (212) 242-0800.